Break a Leg and Carry On ?? Worst-case scenario thoughts abounded as the photos downloaded that day. Look closely at the Great Blue Heron’s left leg. Notice the extra bend? I was really alarmed to see that broken leg. Later on, I reviewed some older photos of that same Heron and realized the break had been there for some time. The photos shown here are all of that same magnificent Great Blue Heron, taken over a period of three years after the photo at the top of this post. Great blue heron with broken leg perched on boulder. Great blue heron with broken leg soaring up high. Great blue heron with broken leg chasing off an interloper. Great blue heron perching on a well-healed broken leg. Thanks again to Ben H and WordPress for their recent WPC Challenge: Resilient. No big-ticket Orthopedic Surgeon bills, no crutches, and no fancy orthopedic boot for this Heron. Nature has a way of healing her own. 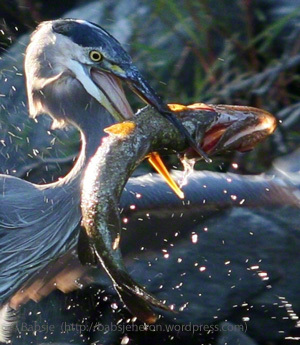 Wildlife needs to be resilient – like this Great Blue Heron – in order to survive. Heart pounding in my throat, partly hidden under overhanging branches along the channel, I watched the chase unfold. Will the Great Blue Heron Fledgling escape the territorial adult? I was returning to shore after a relaxing morning, hoping to get back to the dock before the rains started. The grey skies threatened to open any minute. Passing into the channel, I noticed the adult Great Blue Heron foraging on the south side and so I stopped under the oaks to watch. This particular Heron was a capable fisher and it occurred that maybe I could capture him as he captured a big fish. I looked at the threatening sky and stuffed my camera into a handy ZipLok bag, and stashed everything else below decks, and then settled in to watch him work for his supper. After a few minutes, a Great Blue fledgling landed on the same shore as the adult, about 20 yards east. My heart rate picked up as the fledgling quickly made a beeline for the adult, taking long strides along the water’s edge, closing the gap between them. Usually a fledgling will not try to approach a ‘strange’ adult Heron, and so that behavior was a clue that the adult was a parent of the fledgling. The question was, which parent – father or mother? It didn’t take long to find out, as the adult Heron suddenly erupted from the shore, and burst over the small rock-island. He landed less than five feet from the fledgling, in an unmistakable territorial display posture that told me the adult Heron was the father of the fledgling, not the mother. Female Great Blue Herons will allow the fledglings to join in feeding activities even after the youngsters have left the nest. The father birds, however, will defend their territory and chase away their own offspring. And so the chase was on. Having vanquished the fledgling, the adult Heron landed on a fallen tree jutting over the water, his back feathers still in an erect territorial configuration. He pivoted on the branch and settled in, staring up into the trees. Where was the fledgling? I scanned and scanned the canopy with binoculars but couldn’t find the fledgling. I tried to follow the line of sight from the adult Heron’s angle of view and at last found him about 50 feet up in the trees. And so we three had a standoff – fledgling in the trees, adult on a branch at the shore, and me across the channel, trying to stay hidden below the oak branches. People who know me know that my motto is “Walk softly and carry a long lens.™” Because most of the photos on this blog were taken on the water, it is especially important to give the wildlife an extra-wide margin of personal space so as to not endanger them in any way by venturing too close. As much as I take special precautions to remain hidden from their view, including use of telephoto lenses and natural-cover hides, every once in a while the wildlife sees me. Such was the case yesterday – busted by both birds – the fledgling gazing down from his perch 50 feet up, and the adult glowering at me from across the channel. The question was, which of the three of us would give in first. Would the adult give up his rapt focus on the fledgling? Would the fledgling make a run for it? Would I tire of getting drenched watching them from under the oaks along the shoreline? It was music to my eyes to see the fledgling make a run for it. The adult Heron swiftly took chase, but the fledgling had enough lead time to soar around the corner at the end of the channel before the adult got close. I paddled off after them, well off their intense pace. When I rounded the curve at the end of the channel and panned the sky with binoculars, there was no sign of either Heron. Lazily, I headed into the first cove I came to. There was the fledgling on the southern cove. His body language was anxious, and he was repeatedly glancing back to the mouth of the cove. It seemed like he was “looking over his shoulder” to make sure the territorial adult wasn’t still chasing him. He eventually settled down and began plying the shore for dinner. I felt as though he had had enough excitement for one day, and didn’t need my presence to add to his nervousness, and so I quietly backed out of the cove and headed south. Within less than 3 minutes of leaving the fledgling in the cove, a shadow passed very close and very low over me. It was the fledgling. Thanks to Ben H and WordPress for this week’s WPC Challenge: Edge. Ben has asked for something that kept our heart beating fast. Yesterday’s encounter on the lake kept me on the edge of my kayak’s seat and my heart in my throat and beating fast: would the fledgling escape the territorial adult? Wherein the Bald Eagle was looking for lunch in all the wrong places. Fast forward one year. I had no idea where – or even IF – the Herons would breed again in that area. Suspense was palpable as I ventured south in search of Great Blue Heron fledglings. Over a short distance I counted them. One, two, three… then four, then five. Could there really be five fledglings there? One adult, then two adults – both on alert, staring in the same direction from opposite shores. And then Fledglings six, seven, eight on various patches of shoreline. I hardly knew which way to aim and focus the camera. I panned down the western shore, and the Eagle perched on a stump at the water’s edge suddenly filled the viewfinder. So that’s what the adult Herons were watching so intensely. Scanning the shoreline father south from the Eagle, the whole picture came into view. The Eagle was closely watching two Great Blue Heron fledglings. Great Blue Herons are not noted for being playful birds, yet fledgling Herons, like youngsters of many species, often engage in rough and tumble play. The two fledglings on the shore were engaging in mock-territorial squabbles, one challenging the other, back and forth until they lost interest, all the while unaware of the danger posed by the Eagle nearby. The Bald Eagle quickly took flight up into the tree canopy, unseen by the fledglings, but the adult Heron nearest stood up higher, alert on the shore. I scanned the trees, myself, but no sign of the Eagle. The fledglings, meanwhile, had separated and settled onto separate areas of the shore. I worked my camera, trying to capture as many birds as possible in the rain. Suddenly chaos erupted from the trees, and the Eagle swooped out and down, but just as quickly, some of the Herons took flight, too. By this point, the Heron fledglings had scattered, and the Bald Eagle left the area, without its intended lunch. In the top photo here, you can see the Eagle soaring up and over the trees at the end of the lake. But wait, what’s that you see in the bottom frame above? It was taken 5 seconds after the frame above it, along the same patch of shore. Yes, there were two Bald Eagles that day. Thanks to Ben H and WordPress for their recent WPC Challenge: Rare. This was an exceptionally rare experience to witness. In 2015, I had no sightings of Bald Eagles. Additionally, the bumper crop of Great Blue Heron Fledglings was the largest I’ve observed. On a scale of 1 to 10, that day on the lake was a 15 for me… But not for the Bald Eagle, who left without having lunch. For that, the Great Blue Herons and I are grateful. The herons engage each other during a break in nest building. For the month of July 2016, I will be the Featured Artist once again at the Summer Street Gallery of The Center for Arts in Natick. TCAN is on FaceBook. To give the gallery a visit, please click here. rising from the dry, dry earth. Last week’s photo challenge is Depth. Thanks to Ben H and WordPress for this topic. Our lake is 625 acres, with a depth around 69 feet. The water level fluctuates during every summer, but the summer of 2014 saw a drought unlike years in recent memory. As the drought wore on, the receding waters opened new shallows where the Great Blue Herons could forage. The rains came at last during mid-October, raising the water level more than two feet. How much rainfall do you suppose it takes to raise a 625 acre lake two feet? This week’s photo challenge is Scale. Thanks to Michelle W and WordPress. The three Great Blue Herons here offer a glimpse of the scale of the drought here last summer. Compared to the heartbreaking drought out West, the scope of the situation in Massachusetts was nothing. One of my favorite WordPress poets, John Dofflemyer, has eloquently, poignantly chronicled the impact of the near-five-year-long drought at his ranch. If you like the poetry of Wendell Berry, you will like John’s. Check it out at drycrikjournal.